Postcards featuring images of locations in and around Milton Keynes. Also includes a a small amount from Letchworth. Most were published by the Milton Keynes Development Corporation to advertise the town in the 1980s. 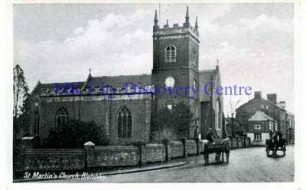 Postcard of a photograph of St. Martin's Church, Aylesbury Street, Bletchley (now part of Fenny Stratford), with two horse and carts along the road. Undated, picture suggests c1900. Colour effect postcard showing two children in hats and dresses walking down Green Drive in Brickhill Woods. Colour-tinted view of St. George's Church, Wolverton. Message on back reads: "Dear S. Hope you will like this. Joe" Addressed to Miss S. Turvey of Aylesbury. Undated, stamp dates it between 1904-1910. Postcard of Market Square, Stony Stratford, facing the church. Postcard showing the view towards Old Stratford from Stony Stratford. 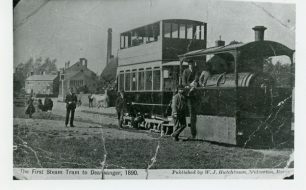 Features a carriage being driven down the road and a motor car coming up the road. Postcard of The Mill, Stony Stratford. Postcard of a colour view of "Cowper's Oak", near Olney. Postcard sent to Miss A Chapman in Kettering, from Edna Loveday, 23 March 1907. Message reads: "Dear Miss Chapman I am staying at my grandmother's at Olney. This is the place where Cowper lived and he used to write his poems in this tree. Expect to see you on Tuesday. love from E Loveday"
Postcard of a photograph of Market Place, Stony Stratford, showing a group of children stood in front of "John Wesley's tree". Postcard of a colour view of St. George's Church, Wolverton. Sent to Miss Nellie Sear, Belgrave Square, London, from "Lizzie", but no post mark or stamp. Undated, c1915. Message reads: "Dear Nellie am sending present hope you will spend a very Happy Birthday and will like the small present I am sendy am sending to Minnie much at same time love from Lizzie"